The idea behind creating a website varies from sharing your expertise, info to promoting the products or services. Everyone has a different way to express their knowledge and also push their products online via websites. But one thing you must require that a best clean website. Before moving onto the list of effective APM blogger template, first, we will have to explore more on what this AMP means. People love to ask so many questions on Google like; What is Google accelerated mobile pages? What is AMP format? What is the AMP page in SEO? What does Google AMP do? What is the AMP website? Do amps require https? How is AMP created? and so on. Google announced Accelerated Mobile Pages (AMP) in the month of October 2015. This is a framework allowing you to create fast-loading mobile pages for your website. This is a specially designed open-source platform. And it allows the publishers to improve the speed. It also helps website owners to give the best possible user experience for their readers on Mobiles. AMP page loads faster on low internet speed as well and hence readers don't have to wait for pages to get loaded. So, the majority of publishers, site owners etc. are adopting this latest and efficient technology. 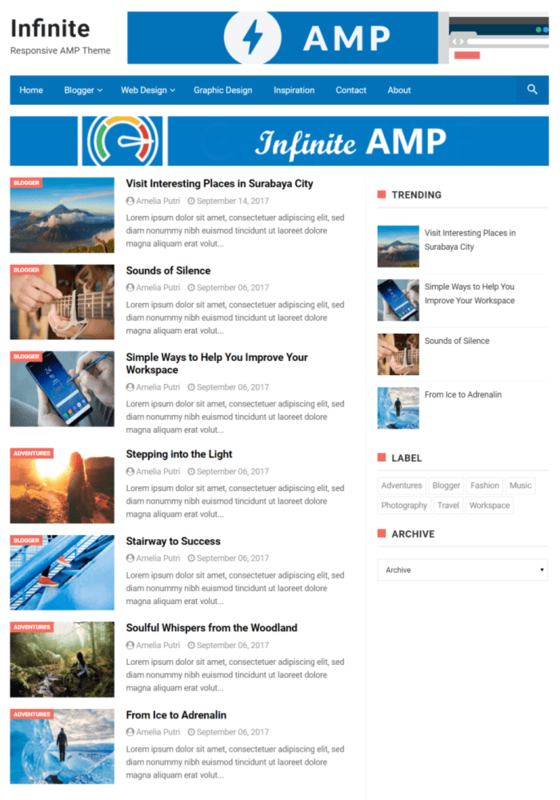 The infiniteamp blogger themes are created by Arlina, a blogger master. 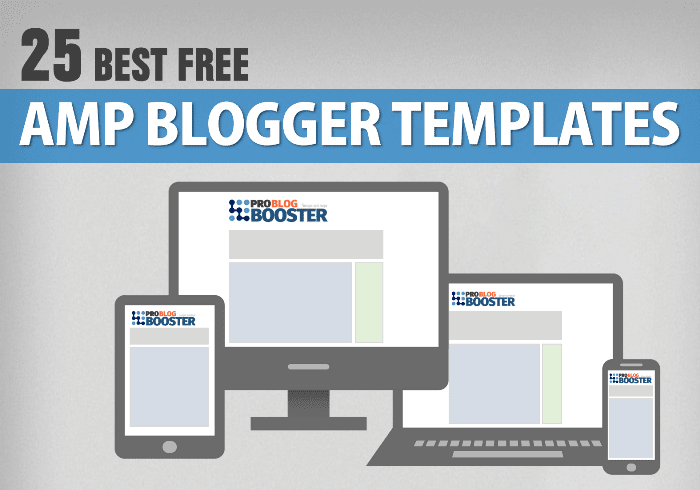 It is one of the best SEO Optimized APM blogger templates. And it is a widely distributed premium theme. It covers features like as SEO Friendly, an elegant Look, ultra responsive, dynamic heading, footer menu etc. Infinite JLB is developed by the Infinite AMP. This is the template which helps in SEO optimization. The meta section of it leads you to make a site more SEO-friendly. Also, sober UI colored design becomes more pleasant. It covers features like dynamic heading, top banner ad, subscribes and social shares etc. Vletters is developed by Bung Frangki. It has a very simple but mobile-friendly website design. it takes few seconds to load and get everything running smoothly. It covers features like menu navigation, breadcrumbs, shortcodes and search box etc. 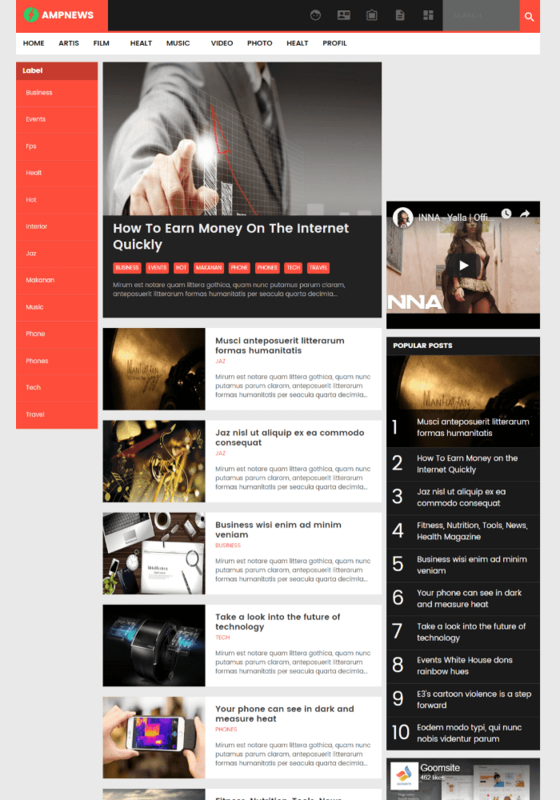 Maknyus AMP blogger template is developed by Raden Gino. This template has simple two column design, quick and responsive, organized layout, bright color. It covers features like fast loading, browser compatibility, social sharing and SEO friendly web design etc. 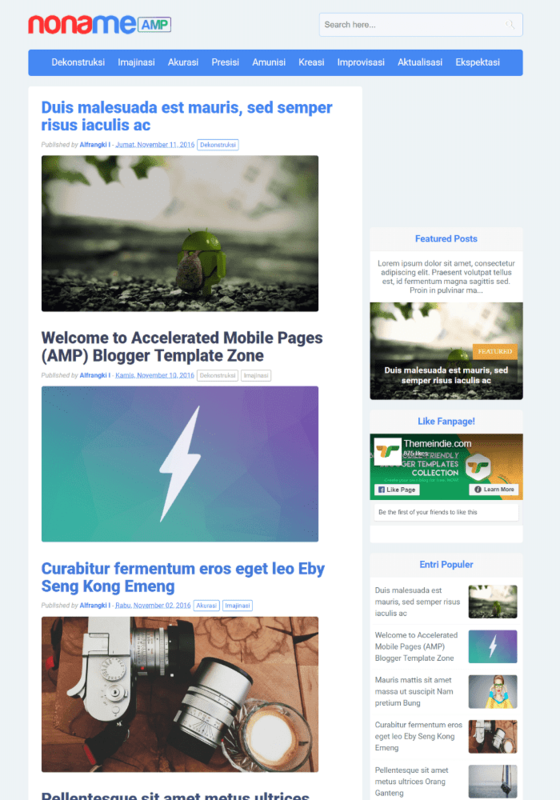 A Blanterde AMP blogger template is created by IDBlanter. It is a two column design and suitable for personal websites. Looks trendy and fully responsive template. It covers features like ultra-fast loading, AMP search box, navigation menus, supports Disqus comments, mobile sidebar, top navigation bar, bright color, AMP-based buttons/iframe/sliders etc. 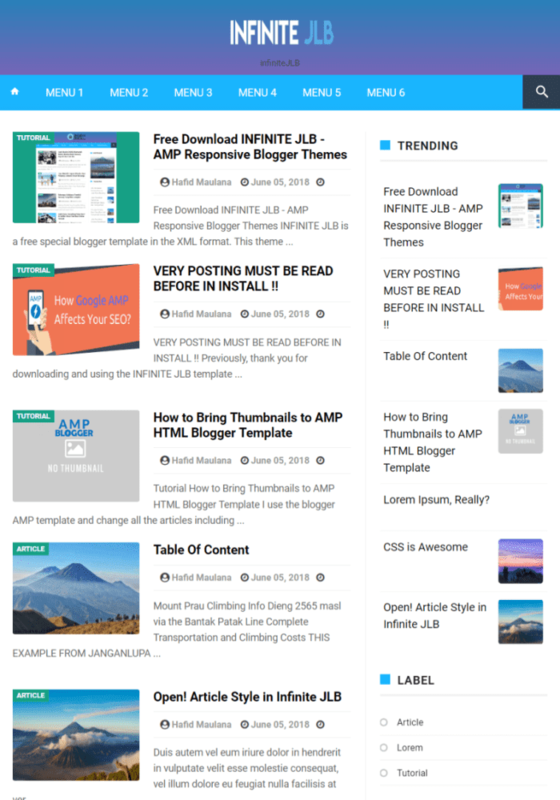 A Siniladom AMP blogger template is created by Ikhwan Zubir. This SEO-friendly blogger template comes with two columns having one right-hand sidebar and 4 footer columns and easy to customize. It covers features like vertical drop down menu, passed AMP Validator, light base colors theme, breadcrumbs, Adsense ready etc. 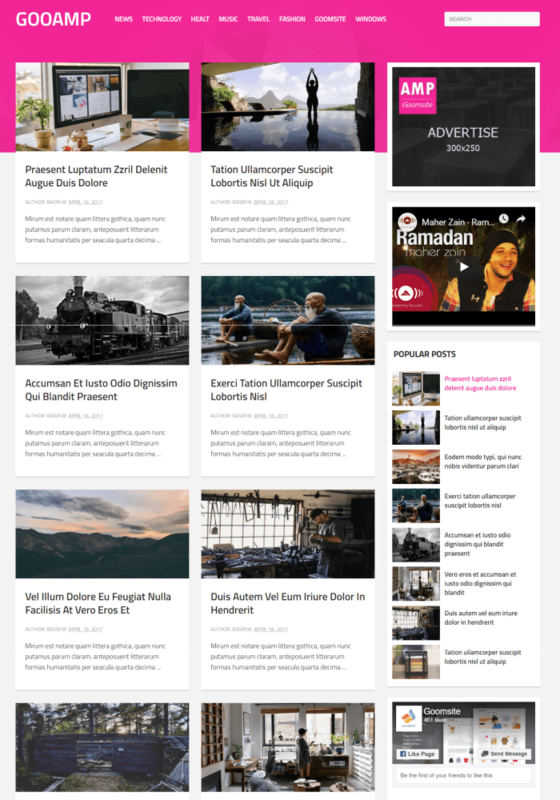 DroidBuzz AMP blogger template is created by Iwan Efendi. It is a fresh and latest AMP template. It is a two column design and has a right-hand sidebar, top navigation panel, bright color, simple. Also, customization of this design is easy. It covers features like mobile friendly, high CTR, auto read more with thumbnail, responsive dropdown menu etc. 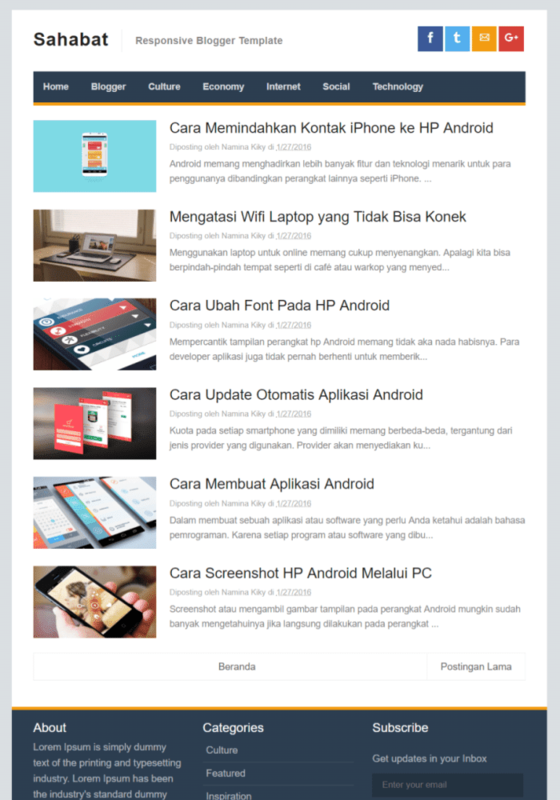 Noname AMP blogger template is developed by Bung Frangki. This template is built and configured for SEO and mobile friendly as well. It covers features like Auto resize thumbnail image, cross-browser compatibility, build with CSS3, responsive ads slot, support SSL/HTTPS etc. 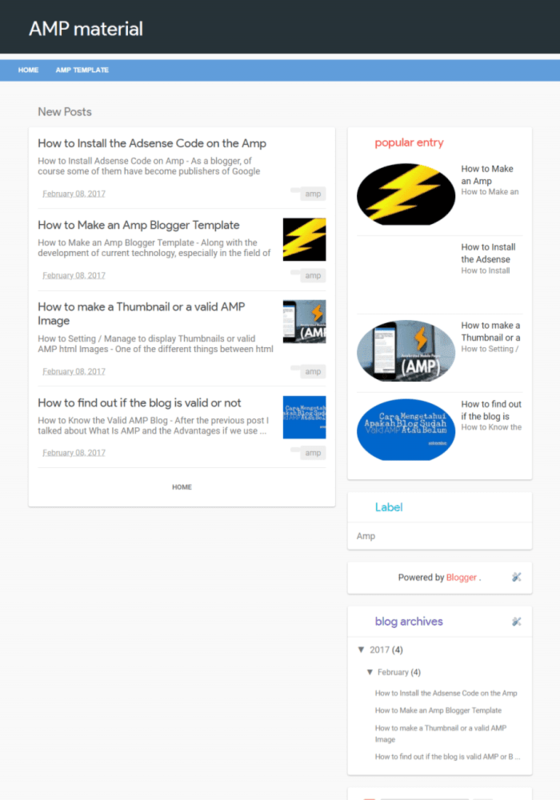 AMPNews blogger template is a responsive theme. 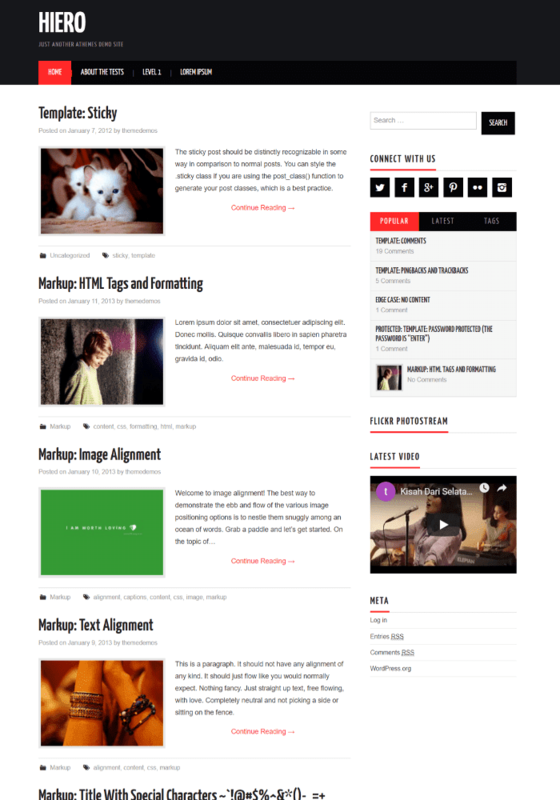 It is free and cool blogger template. Perfect for the magazine, news, blog websites. It covers features like SEO friendly, supports Disqus comments, drop-down menus, navigation menus, mobile-friendly, responsive etc. 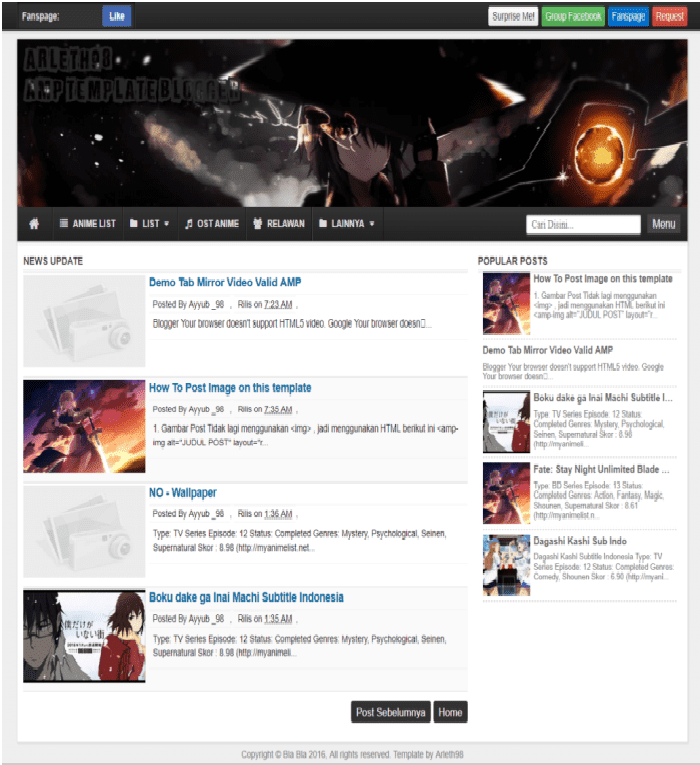 The Megumin AMP Blogger template was created by Arleth Desz. 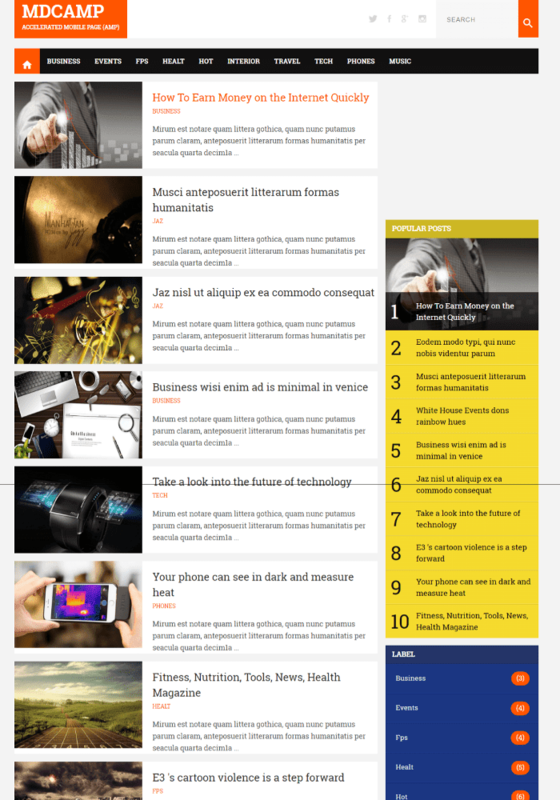 It is a stylish and most responsive AMP powered blogger template. It covers features like Valid AMP, valid Structured Data, fast load, Adsense ready etc. 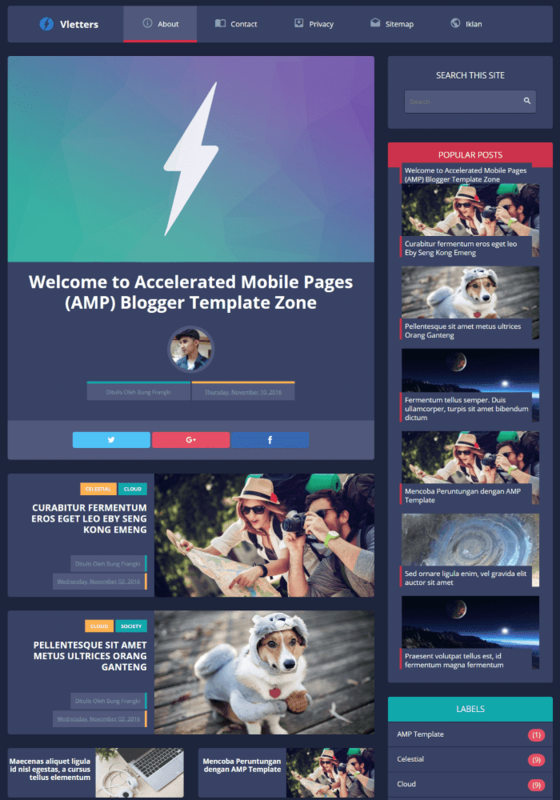 Materi AMP blogger template has widgets like search, back to top, popular posts, fast access speed, Optimized advertisement location, etc. It is one of the best SEO Optimized APM blogger templates. It covers features like a valid AMP, valid Structured Data, fast load, Adsense ready etc. 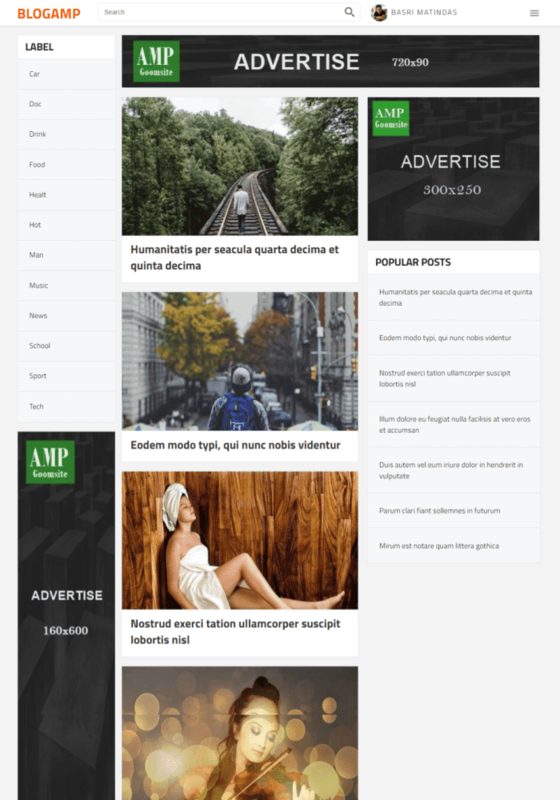 EVO AMP blogger template created by Blanoid. 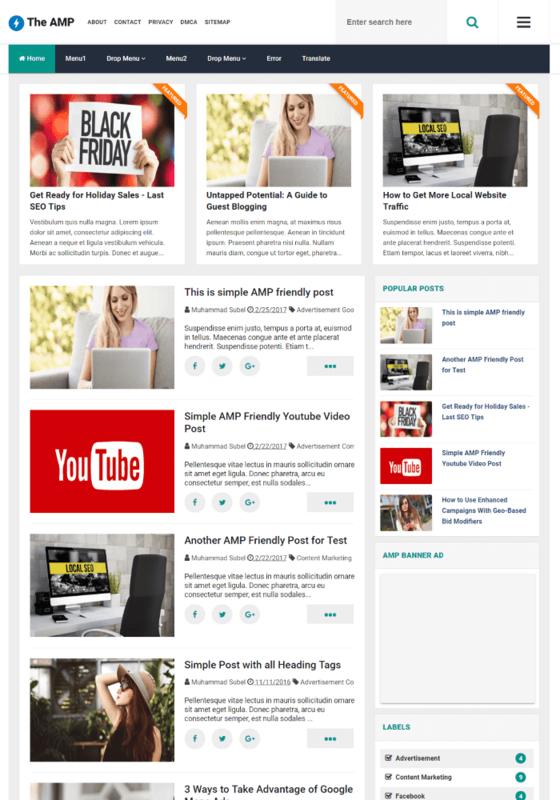 This best selling AMP blogger template has widgets like search, back to top, popular posts, fast access speed, optimized advertisement location, etc. It covers features like modern Blog, search, inbuilt related post etc. 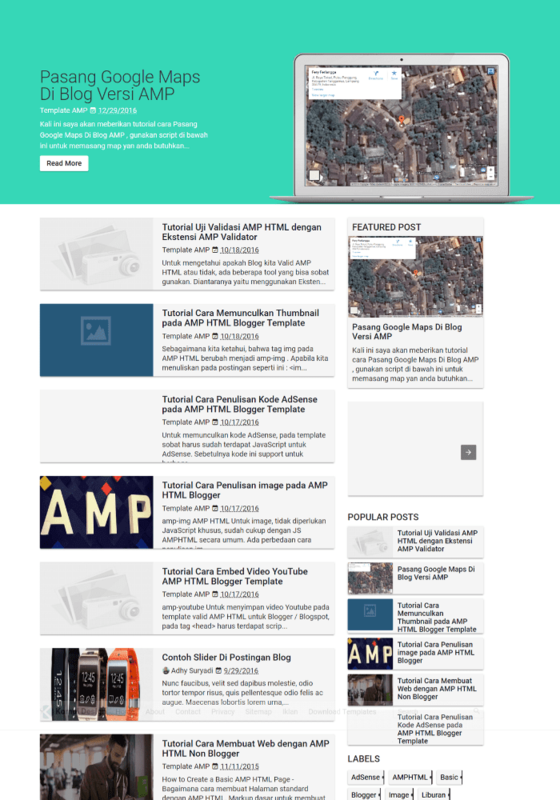 An MDCamp AMP blogger template is created by Nato Player. He has webmasters which can design web pages that are fast loading, with less inputs from experts. It covers features like high CTR, responsive, related posts with thumbnails, etc. 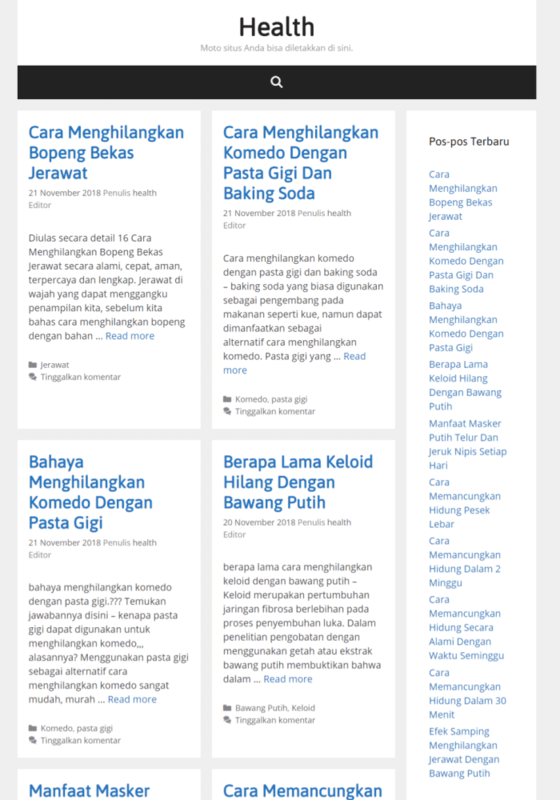 Blogku AMP blogger template is developed by Mas Sugeng. It covers features like SEO Friendly, clean, simple, breadcrumb etc. 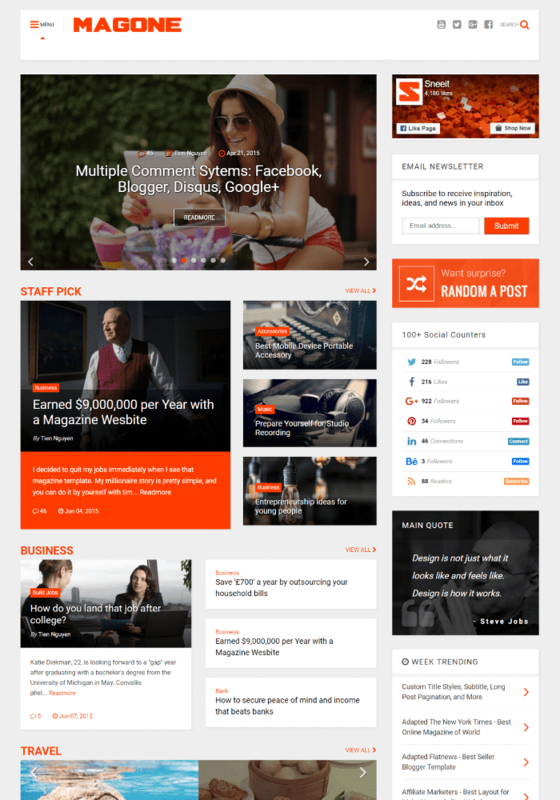 Magone AMP Blogger template is developed by huge people. It covers features like SEO friendly, clean, simple, breadcrumb etc. 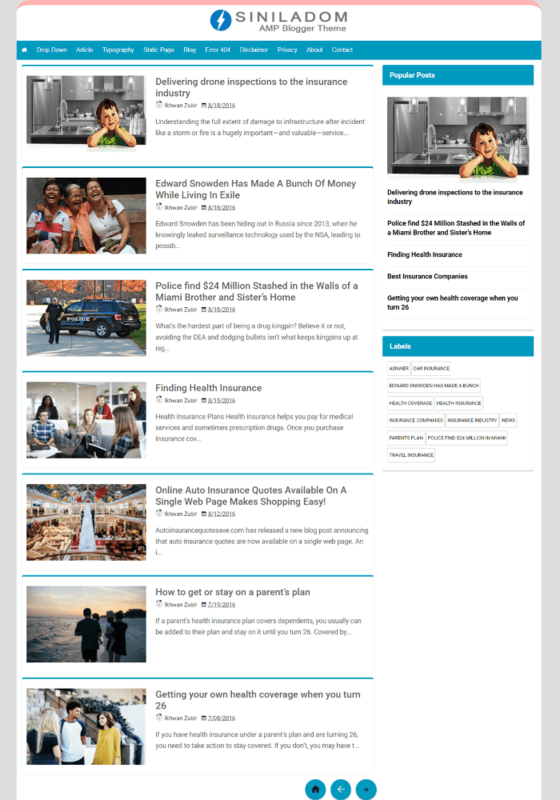 and it is a flexible and responsive magazine template for Blogger or Blogspot websites. 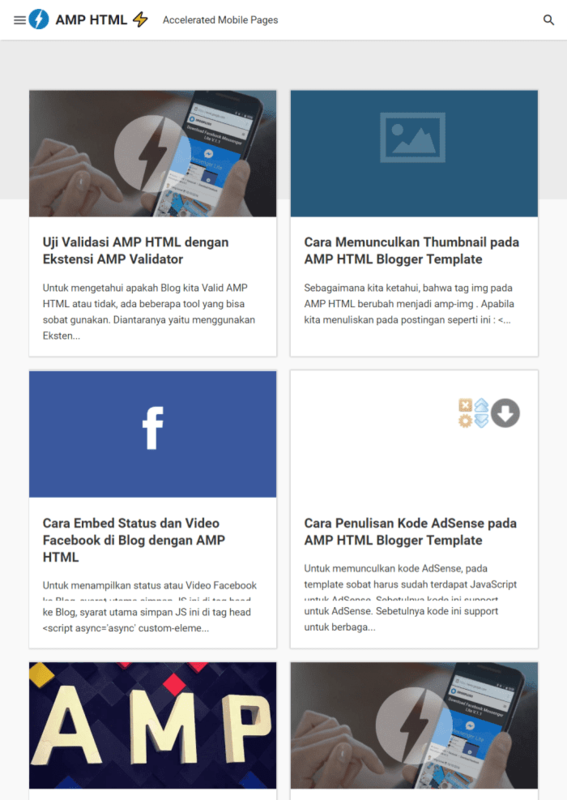 Kompi AMP blogger template is developed by Kompi AJaib. It covers features like Custom Error 404 Page, support SSL/HTTPS, etc. 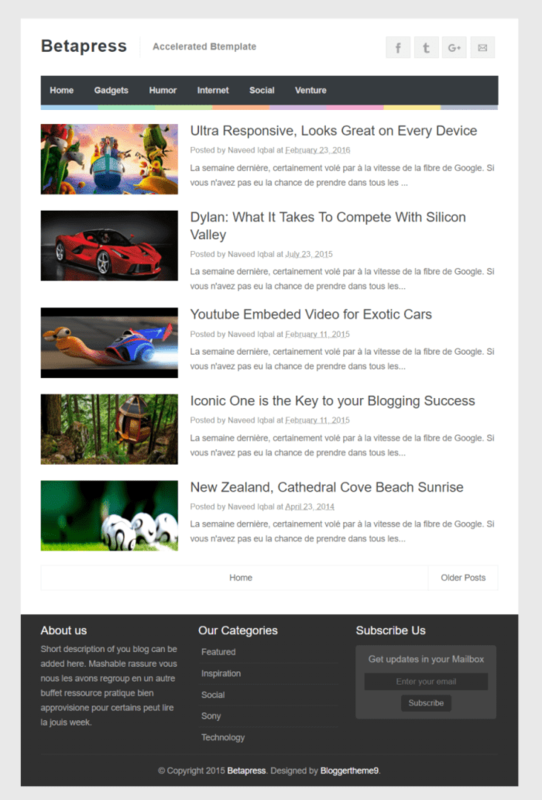 and it is a flexible and responsive magazine template for Blogger / Blogspot websites. Hiero AMP blogger template was originally adopted from the WordPress. It covers features like responsive layout, post thumbnails support, threaded comments, 100% mobile-friendly, thumbnails for related posts, header ad banner area etc. 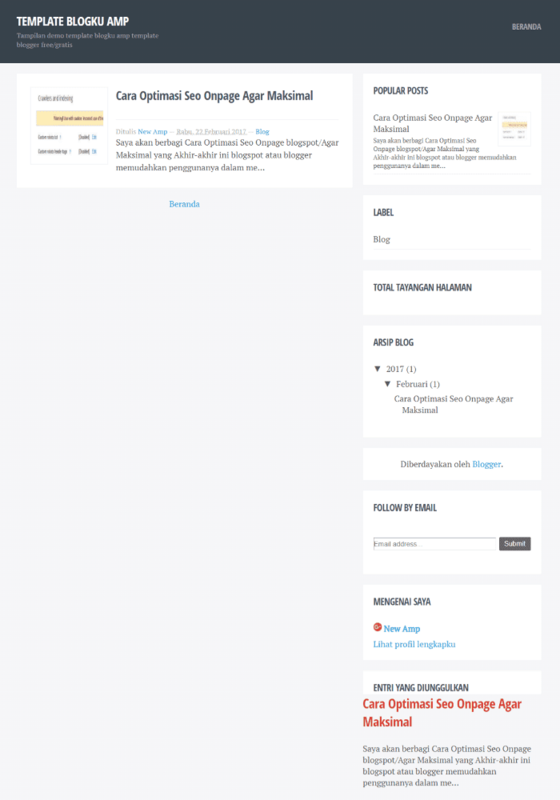 BlogAMP Blogger template was originally created by Basri Matindas. It covers features like ready advertisement fields, quick responsive, Compact post body, fast page speed loading, etc. Sahabat Blogger template was originally created by Gaurav Design firm. This responsive AMP design covers features like post thumbnails support, threaded comments, 100% mobile friendly, thumbnails for related posts etc. 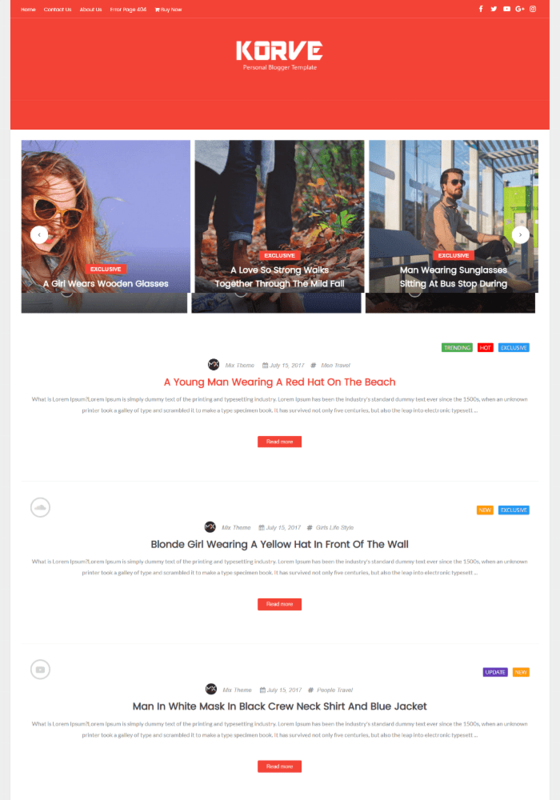 The Korve is a blogger template which looks clean, elegant and personal Template. It provides a clear, an organized SEO template so that your content looks great on any kind of device. It covers features like easy to customize, post advertisement area, well documented etc. TheAMP is a blogger template which looks clean, elegant and personal Template. Recently, this is the most used AMP blogger template on the internet. 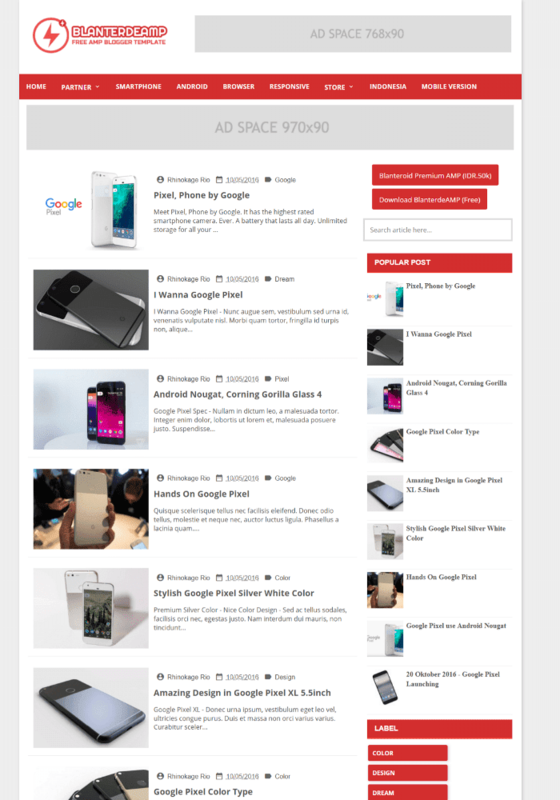 It is a very fast loading, Adsense ready, highly SEO optimized, and feature rich AMP blogger template. It covers features like the Disqus comment system, social buttons, and popular post widgets etc. 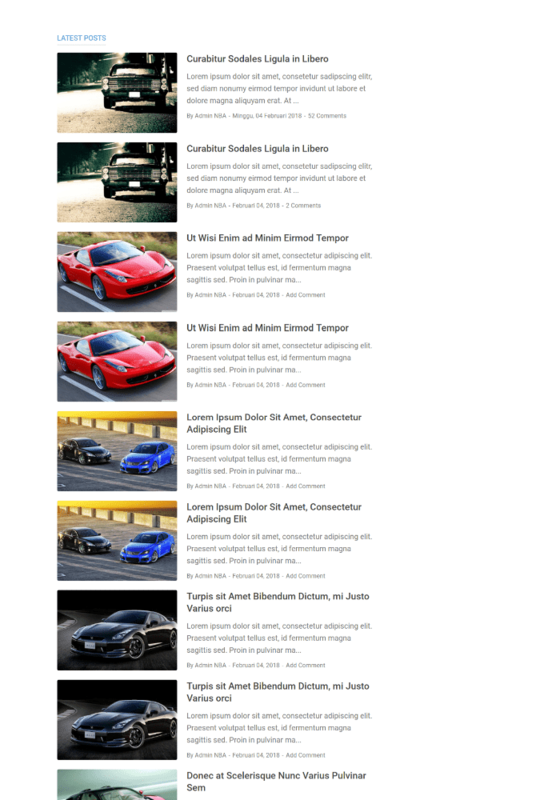 AMP HTML is an amp ready box style looking free AMP blogger template. It has a simple two column layout, switching menu making your site to look neat the reader's devices. Goo amp blogger templates is an amp template with a present-day style, this template is ideal for the blog, review, and private niche blogs. with a view that has accompanied the cloth, mobile-friendly layout templates seem elegant and fast loading, and free. Semi AMP - A SEO friendly blogger template and responsive has a mobile-friendly design, ad ready, popular post & related post widget, social share icons, responsive menu. 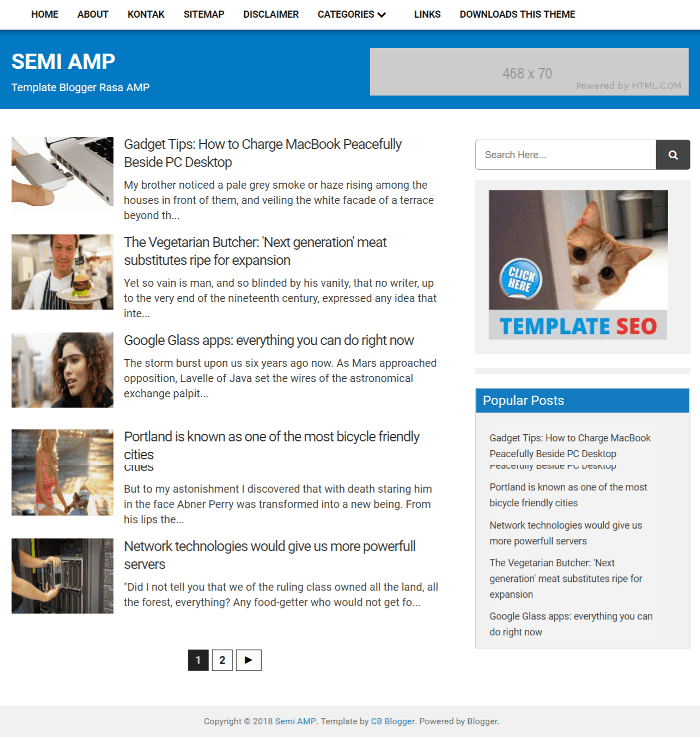 Semi AMP blogger template is made especially for the news blog, photo/video gallery blog, gallery blog etc.